As I dip my toes into the ocean of distance running, I've begun to spend a lot of time alone with my brain and body. I'm learning that I can either let my brain be the boss of my body, or I can use my brain to be the boss of my body. There is often a moment in a long run where it feels a little terrible and a lot impossible. You can't hold this pace. Why do you do this to yourself anyway? You should quit. The voice does its best to fill me with doubt and worry when I'm tired and scared of the unknown. 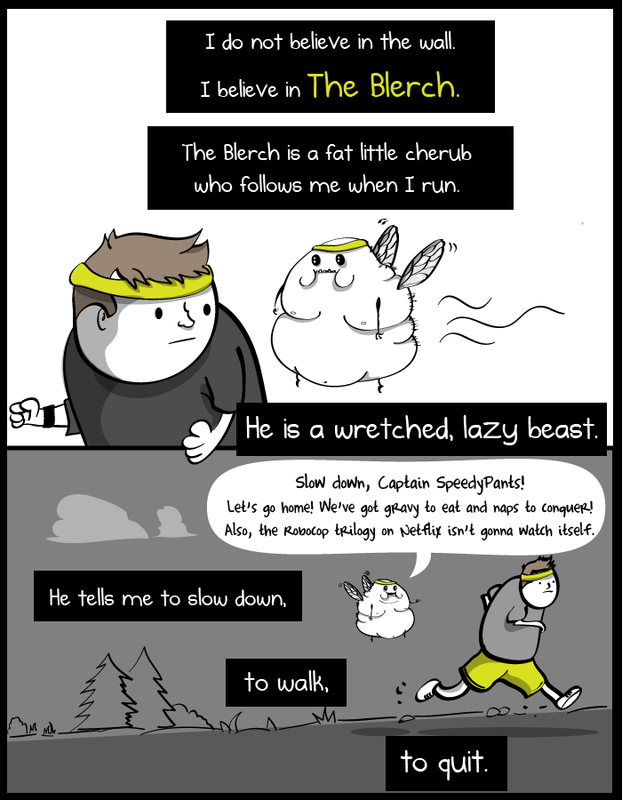 The Oatmeal comic artist/ ultramarathoner Matthew Inman refers to this voice The Blerch. When endless piles of knee-deep snow forced my first month of long marathon training runs to the treadmill in the basement of the YMCA this winter, I couldn't imagine how I could possibly make it through the miles of staring at a concrete wall on a human hamster wheel. Enter The Blerch. But, then, I started to discover that I could Beat The Blerch if I took control of my own voice. If I made my voice keep repeating the things I wanted to hear, my body listened. I reminded myself that running is something I do because it feels good. The Blerch faded to white noise. And so, my cheesy love of running mantras was born. Shoulders over hips. Hips over knees. Breathe In. Breathe Out. This one's a tried-and-true classic, with good reason. It's the easiest to focus on. Dedications are the for the miles where I step outside what my body is experiencing for a moment to think about the people I love. Running is a pretty selfish pursuit of mine. More often than not, I do it alone, on my own terms, because it makes only me feel good. Well, dedicating miles to others is admittedly self-serving, too. Thinking about the awesome people I have in my corner inspires me to keep moving forward. And dogs. Duncan pretty much always gets a mental shout out when I'm running. Hit Cruise Control. Despite having read a thousand running articles advising me to start longer races conservatively to save fuel for negative splits in the latter miles, I inevitably bound off when the gun fires and start running faster than I should. So at mile 3 or 4, I make it a point to find a settled pace and cruise. Extra bonus if I plan my Spotify playlist well enough that Tom Petty and the Heartbreakers Runnin' Down A Dream comes on while I'm repeating this mantra. You can stand anything for 10 seconds. This is a new mantra I've just adopted from the quotable Netflix show The Unbreakable Kimmy Schmidt. Kimmy's motto is to take everything in life 10 seconds at a time. Then, if you make it through 10 seconds, start a new 10 seconds! 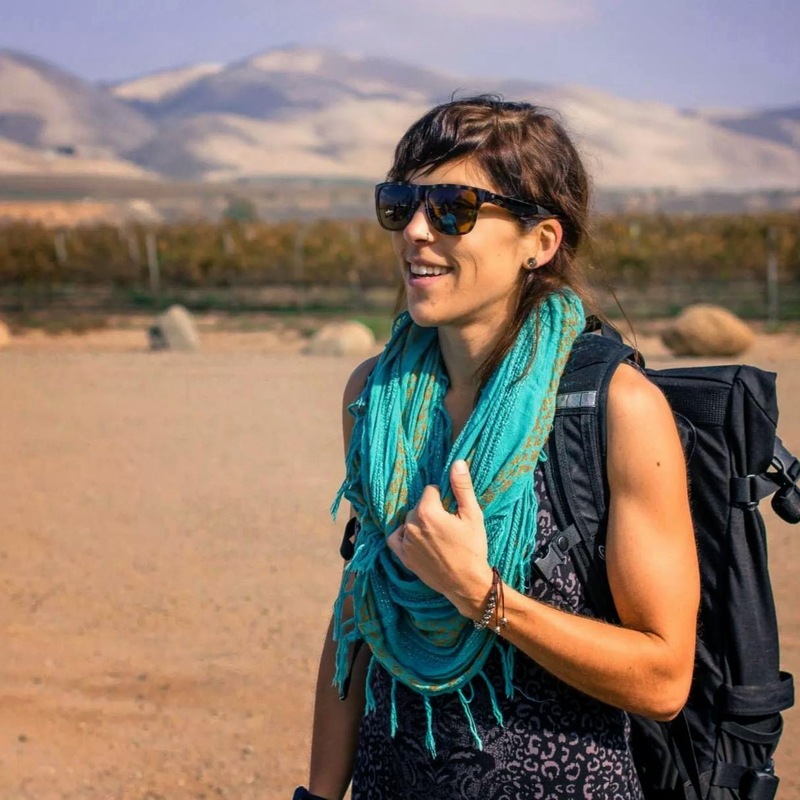 Kimmy developed her 10 seconds mantra for survival while kidnapped in an underground bunker...but it works for me when I feel overwhelmed (in running or life). PIZZA, PIZZA, PIZZA! Can easily be substituted with: PANCAKES, PANCAKES, PANCAKES! or BAGEL, BAGEL, BAGEL! Release the Kraken! 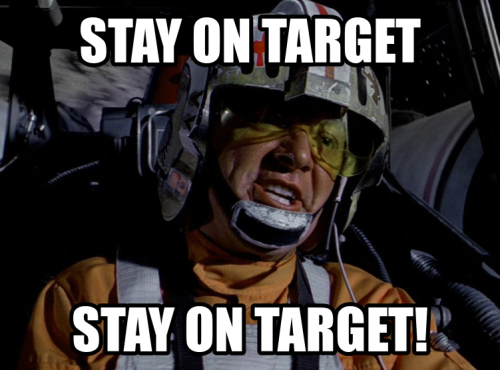 This catchphrase is called out by Zeus in the 1981 film The Clash Of The Titans (and by Liam Neeson in the 2010 3D remake). I shout it silently to myself near the end miles of the run or race when I allow myself to cut the reins and run no-holds-barred. It's usually the most exhilarating part of my run. Bring it Home. I end each run by bossing my body with The Boss in mind. Decide what to be and go be it. This lyric from the Avett Brothers song Head Full of Doubt, Road Full of Promise finds its way into my brain every single time I'm running. Of all of the mantras I use, this is my favorite and the one that makes me feel the most feelings. It also gets me out the door when my alarm goes off at 5:00 am and it's cold and raining and I don't feel like running. Repeating it to myself reminds me that all the things I choose to do are, in fact, my own choices. I decide. Most of what I hope to accomplish will take a lot of work. I can do work. To tackle my first-ever 18-miler on Friday, I wrote down a planned mantra for each mile on a piece of paper and shoved it in the zipper pocket of my handheld water bottle. As you can from the cross outs, some of the mantras went by the wayside while I ran. Miles 9-11 are frequently my tough miles. At mile 9, my body felt fine, but my brain was struggling. 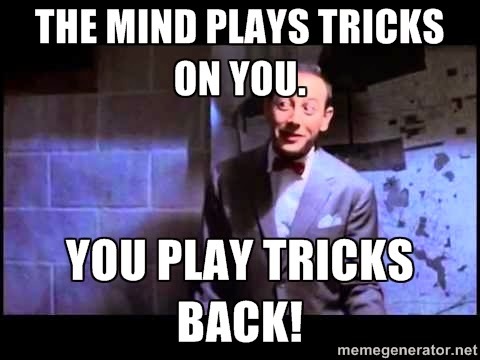 The funny thing is, now that I've been practicing this strategy for a few months, the saying my body needs to hear just pops into my head when I need it.